The Phantom 530 has all the beloved features of the original Phantom chassis, with fully-modular hard drive cages, a discrete SSD mount behind the motherboard tray, NZXT's signature rear I/O LEDs, a single channel 30W fan controller with integrated 10-port fan hub, and steel 5.25in. optical drive latches. Now, Phantom 530 has more for you. It offers more cable management space up to 34mm (70% more than the original Phantom chassis), and supports more airflow and water cooling. 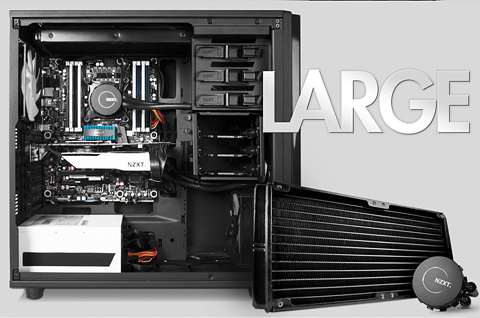 Fits large water cooling radiators up to 360mm in size. Native support for the world's largest all-in-one liquid coolers, the 140mm / 280mm NZXT Kraken™. 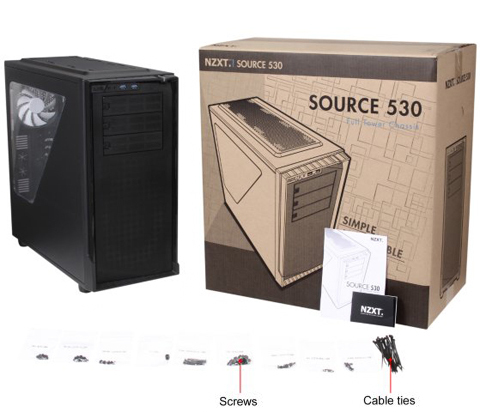 The Source 530 features fully modular, interchangeable hard drive cages, offering unmatched customization at its price point. The Source 530 is filtered using three full coverage removable filters, keeping your components clean. Up to 34mm of cable management clearance, a 10-port fan hub, and a discrete SSD mount gives you room for a beautifully clean build. 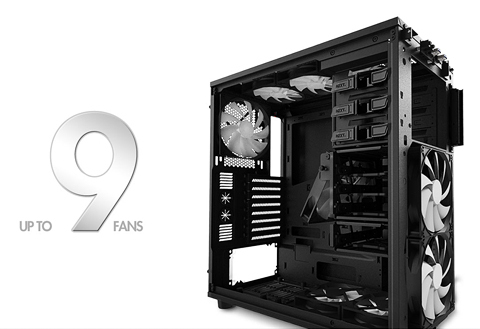 6 x 3.5" / 2.5"
19.96" x 9.25" x 20.10"
Can install up to 9 fans for extreme air cooling. 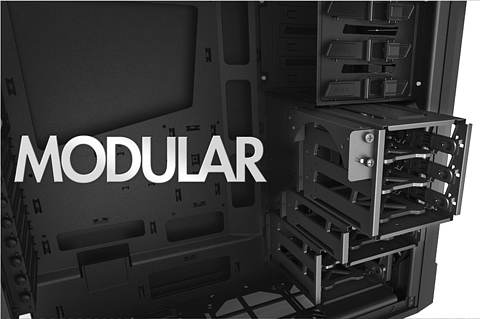 Fully modular drive cages offer unmatched customization and enable you to only use what you need and keep airflow to a maximum. Fully filtered intake with a large filter for the front intake and two smaller filters for the bottom front and PSU intakes. 34mm of cable management space means that your cables will have an absolutely cavernous place to reside. 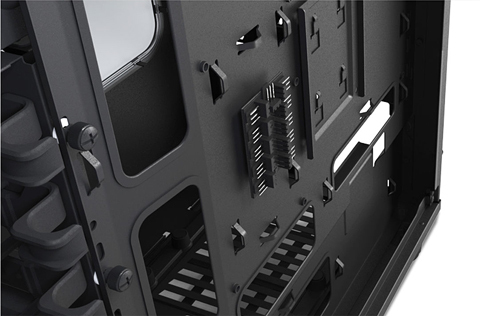 Discreet SSD mounts help keep your build free from excess wires. Our signature 10-port fan hub allows you to route all your fan cables through the rear of the case, keeping the front nice and tidy. Pros: Tons of room and lots of room for fans bought a year ago and had no problems what so ever, installing all components went smoothly, installed 7 120mm fans so everything is quiet and cool. I've done a lot of mid tower builds so this was very easy to work with, definitely satisfied with this case. Other Thoughts: NZXT makes great cases period. Cons: -The hard drive mounting brackets are plastic, with pins that are difficult to insert unless you pull them partly out. -You will need a 2.5 to 2.5 adapter to securely mount any 2.5 " drives, as the included method is insecure. -The built in fans and fan expansion terminal are 3 pin instead of 4 pin. so no speed control. But the 2 Included fans are so quiet that they don't need it. -Front cover looks hard to remove. Since there's plenty of room for fans, I have no need to remove it. Pros: - Plenty of space and sturdy build. - I find it very aesthetically pleasing, can't go wrong with black. Cons: - I had a miserable time installing the 3.5" hard drive I bought into the hard drive trays, I at first loved the design until I tried following the directions. The pins would pop out each and every time I placed the drive into the tray. I ended up giving up and replacing them with some screws - which have worked out so far, but not as firm a fit as it possibly could be. Other Thoughts: - I likely wouldn't have bought the product if I knew more about the design on the front. Apologies for the problems you experienced with this product. If you have not done so already, we would happily get you a replacement if you could make a ticket on our support site. If you could go to support.nzxt.com and create an account and submit a ticket, we can go ahead and get you a replacement. Thank you for understanding and once again, apologies for the trouble you had encountered. Pros: Easy to disassemble, mostly made of metal, holds great potential for cable management and excellent airflow, has USB 3.0 capabilities in the front panel along with 3.5mm Headphone and microphone jack(separate jacks), ability to hold 6 storage drives and 3 CD ROMs, a lot is removable allowing for ease of access. 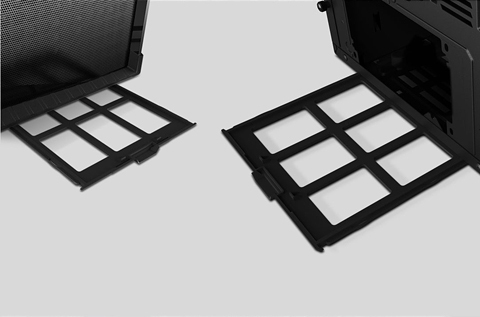 Cons: My one problem with this case would be the drive bays (they call them cages). The part that hold the drive is plastic, which should be alright for the most part, but the part is removable so there's potential for breaking that part. My drives (3.5" Western Digital Blue, 3 of them) do not fit well. The screw holes are slightly off and only on one side, making the drive sit on an angle. I also have a drive that has an IDE connection, in order to use would need an adapter, I have one but it sticks out another two inches away from the drive. To make the drive and adapter fit in my case I needed to unscrew the screw and shove it as far back as I could, making it rather insecure, even after that it was a tight fit. The last thing would be the drives seem to be semi-secure in the plastic bay, they have a little friction keeping them in place, but this seems to only apply to a couple of the plastic parts, some of them came bent. The plastic pieces also come with an odd piece that made little sense to me, it fits into the screw holes of the drive, but is not a screw, no threads. It has a bit of rubber around it and it sits in the plastic, I looked at the manual (as you should always do) and found that the plastic should apparently bend open, like a hinge. These pieces do not do that, if someone would to follow the instructions exactly, they would break the piece of plastic. Granted I'm assuming if the plastic pieces did open like they are depicted to in the manual the rubber-metal pins in the plastic piece would secure the drive nicely, this however is not the case. I did not want to break the plastic pieces to fit my drives in, so I just removed the pins entirely. This isn't the only case of misleading information in the manual either, the screw package does not come with '6-32 5mm', but the manual says it does. I browsed through the manual and found a couple other instances of the pictures in the manual not lining up exactly with what the part is supposed to look like. If you can deal with the annoying drive bays, this is alright case. It fits my stuff well and keeps things very cool, a lot better than my old case. Other Thoughts: I would, but only if they have they patience and common sense, if someone were to not follow the instructions and notice the differences in the manual and the case, they would end up breaking or messing it up. This case is certainly not a great first choice for a case. Pros: Well ventilated, my build is a hot runner but air is enough to keep it cool! Removable dust screens keep it spotless inside after 2 years. Cons: The interior is unnecessarily modular, the ads and videos make it seem like a greater feature than it actually is. Other Thoughts: I would be hesitant to recommend this to a friend. Pros: lots of places to install fans. Cons: The front panel on the case makes sound because of normal vibrations that computer has(probably hard drive vibration because I have not installed any fan on the front panel even though it has a allocated spot for it) I know its front panel because I removed it and sound stopped. If your case is having issues please contact us at nzxt.com and we would be happy to help . 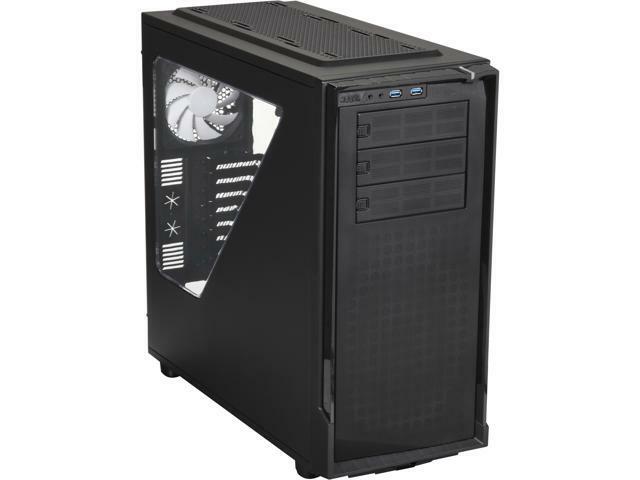 Pros: REALLY big case so you have plenty of room to work in and to put fans in. Lasted me about 3 years so I guess that's something? More of a Con than a Pro but whatever. It lasted the life of my PC so that's something. Cons: Be very careful when working in this case, it'll cut ya. The metal around the rear fan is pretty thin and on mine has managed to bow outwards a bit. Because of it's tendency to cut you while working on/in it, it makes doing work in it a pain and almost not worth it. Not to mention the fact that the front panel is difficult to take off. Other Thoughts: Nope, nope and NOPE! Do your research people! I can't in good conscience recommend this case sadly.